The system also selects the proper mix of heated or cooled air that raises or lowers the interior temperature to your preference as quickly as possible. 2. Adjust the interior temperature using the temperature control dial. 3. Press the (on/off) button to cancel. 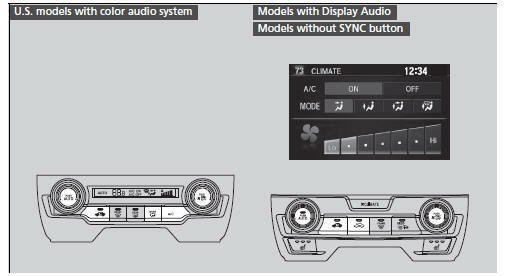 Press the CLIMATE button to display A/C, MODE, fan control information on the audio/information screen for several seconds. Select icon to turn on or off A/C, change the vent mode, or change the fan speed. The AUTO indicator will go off, but functions unrelated to the button that were pressed will be controlled automatically. 2. Adjust the interior temperature using the driver’s side or passenger’s side control dial. 3. Press the button to cancel. 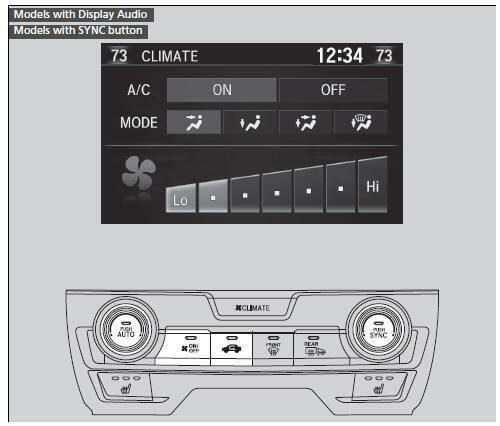 Pressing the button switches the climate control system between on and off. When turned on, the system returns to your last selection. While in the ECON mode, the climate control system has greater temperature fluctuations. Press the (recirculation) or (fresh air) button to switch the mode depending on environmental conditions. Fresh air mode (indicator on): Maintains outside ventilation. Keep the system in fresh air mode in normal situations.